There is a lot to do in Cyprus and everyone should be able to find something to keep themselves occupied. For the sporty there is everything from diving, golf, go-carts, and every kind of water sport imaginable. You can even ski in the Troodos mountains in the winter. 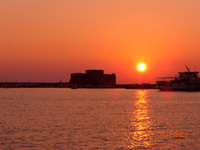 For those that enjoy a bit of history, Paphos is a UNESCO World Heritage location with many ancient monuments and ruins. For those that enjoy life in the slow lane you could simply laze around the pool or on the beach with a cocktail or beer in hand, or enjoy some of the many very good bars and restaurants in the area. For details of the various activities and sights, select one of the options to the left. Paphos is one of the most beautiful and ancient towns of Cyprus. Wherever you tread in Paphos you come across its glorious history which dates back thousands of years, when the cult of the goddess Aphrodite who emerged from its seas, flourished in this beautiful part of the world attracting many visitors from inland and abroad. Today it is a small harbour town, but in Hellenistic and Roman times it was the capital of Cyprus. Still under the spell of the goddess Aphrodite’s beauty, the area retains its magic, unaffected by the passage of time. Visitors are seduced with the majestic landscapes, lovely coastline, historical treasures and delightful villages where tradition is still a way of life. Paphos is believed to be the birth place of Aphrodite, the Greek goddess of love and is a popular resort destination ideal for families. The city of Paphos is split into two parts, the upper part mainly the residential area, and Kato Paphos by the pretty harbour, the lower part of the town. You will find many open air tavernas to sit and relax in the warm sunshine, whilst watching the little fishing boats bobbing up and down in the water. Along the seafront there are many cafés, bars, restaurants and souvenir shops. Paphos is rich in ancient sites, dating back to the the Roman ages, among them the House of Dionysos and the Villa of Theseus, with beautiful mosaic floors, and the Tombs of the Kings. Other places of interest include the Paphos District Museum, the Byzantine Museum, Paphos Fort commanding the harbour, the remains of the Byzantine castle of Saranda Kolones, and Panagia Chrysopolitissa Church, the largest early Christian basilica on the island.